Posted on Sep 8th 2010 - Subject: PokerInside + RakeMeBack = SOLID DEALS! 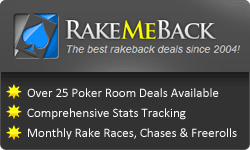 PokerInside is proud to announce that we have merged with RakeMeBack.com. Members can now benefit from access to the best rakeback deals in the industry. RakeMeBack has reliably been serving poker players since 2004, providing great rake deals and trustworthy customer service. Rakeback is one of the best ways for serious poker players to ensure that their poker experience is a profitable one, so sign up today to start getting more of your rake back. Take a look at our brand new Rakeback section > CLICK HERE if we alredy have acount on some poker network is it posible to make a some deal? Posted on Sep 8th 2010 - Subject: ? why i have been taken 6 nib after my question? Its first time registration only as usual unfortunately. Regarding your nibs make sure you are not posting multiple time in a row just to make quick nibs because these posts are deleted and therefore nibs taken away. Maybe U havent played enough to get nibs? Look @ your point bankroll! hi! why we can´t joint the 5k vip freerrol anymore ?? tks! why i have been taken 6 nib after my question?nibs is very good thing sometimes:)))2 zemuogynas. na ir kur tu juos desi tuos nibus?? :) Geriau juos rinkti zaidzant.